Having had the pleasure of meeting ethical consultancy GCM recently, to discuss how we could help support their mission to create compassion and meaningful change within organisations, we decided to stay the night ahead of other meetings in an altogether fitting hotel. 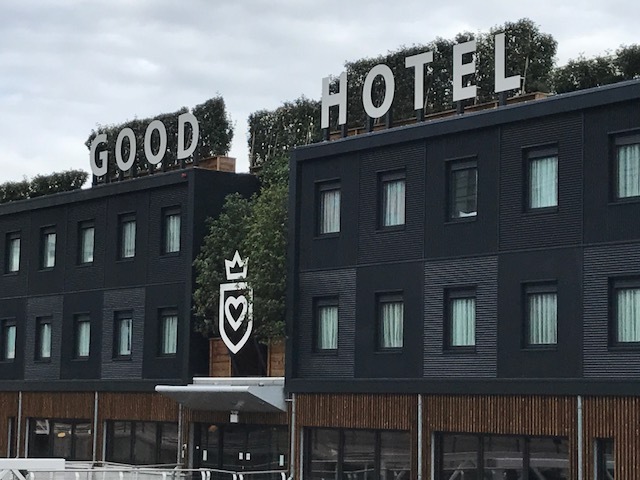 Good Hotel is something of a single-handed humanitarian machine and you don’t have to scrape far beneath its remarkable facade (if at all) to see how completely it epitomises what it means to be a compassionate brand. Unlike neighbouring chains, this hip hotel with a laid-back vibe, beats with a consummately compassionate heart, ploughing profits straight back into the business and offering training and jobs locally, to the long-term unemployed. Currently moored up in London Docklands, the hotel was transported over the North Sea, from Amsterdam, where its founder Marten Dresen first launched the concept. With its entire approach rooted in the local community, ingredients, materials and labour are all locally sourced from small business owners and craftsmen. And it acts as a leading example of how doing business and doing good can be intrinsically linked to spectacular effect. Its bedrooms and living spaces elude understated industrial chic while having been wholly designed using natural, durable and re-purposed materials, including handcrafted wooden furnishings, made locally using wood from the building in its former state. Not only does a stay at this unique hotel support the local people employed but children from low–income families living in the mountain villages around Antigua, Guatemala, directly benefit. Initiatives such as Good Hotel herald a significant move away from social enterprises being perceived as positioned on the fringes of the business world to being rooted firmly at its centre, delivering their message far and wide. GCM helps businesses to not only work better but be better. It’s good to be good.